Almohade sultan; ruler of Morocco and southern Spain at the beginning of the thirteenth century. The rule of the Almohade sultans necessarily proved oppressive to the Jews under their sway. They had to choose between conversion to Islam and quitting the country. Many adopted the former course, though only outwardly, a practise sanctioned to a certain extent by Maimonides' father, as well as by Maimonides himself. This was not unknown to the Jewish authorities, who acquiesced in it. Abu Yusuf Ya'aḳub (1184-98), himself a noted theological authority among the Almohade rulers, hoped to make the proselytes better Moslems by ordering them to wear a special garb, consisting of a black gown with long sleeves, a coarse veil to serve as headgear. 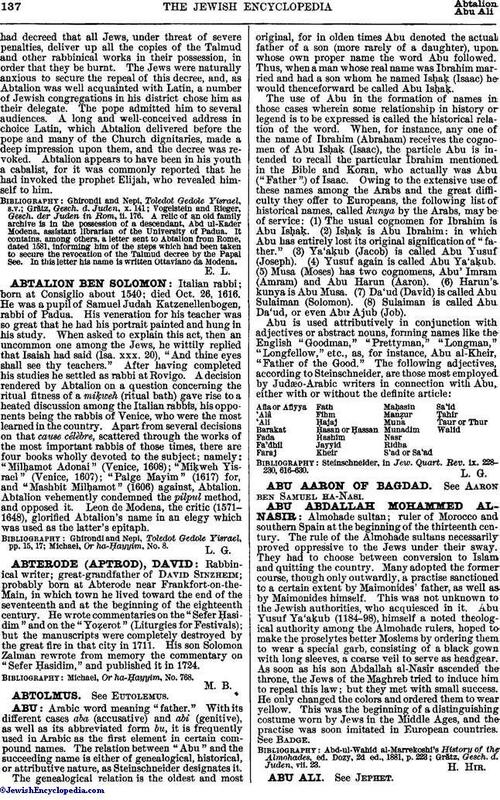 As soon as his son Abdallah al-Nasir ascended the throne, the Jews of the Maghreb tried to induce him to repeal this law; but they met with small success. He only changed the colors and ordered them to wear yellow. This was the beginning of a distinguishing costume worn by Jews in the Middle Ages, and the practise was soon imitated in European countries. See Badge. Grätz, Gesch. d. Juden, vii. 23.